Father Seraphim spent his time in ascetical struggles. His cell rule of prayer was based on the rule of Saint Pachomius for the ancient desert monasteries. He always carried the Holy Gospels with him, reading the entire New Testament in the course of a week. He also read the holy Fathers and the service books. 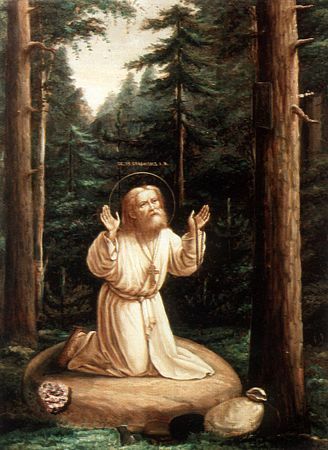 The saint learned many of the Church hymns by heart, and sang them while working in the forest. Around his cell he cultivated a garden and set up a beehive. He kept a very strict fast, eating only once during the entire day, and on Wednesdays and Fridays he completely abstained from food. On the first Sunday of the Great Fast he did not partake of food at all until Saturday, when he received the Holy Mysteries. Three robbers in search of money or valuables once came upon him while he was working in his garden. The robbers demanded money from him. Though he had an axe in his hands, and could have put up a fight, but he did not want to do this, recalling the words of the Lord: “Those who take up the sword will perish by the sword” (Mt. 26: 52). Dropping his axe to the ground, he said, “Do what you intend.” The robbers beat him severely and left him for dead. They wanted to throw him in the river, but first they searched the cell for money. They tore the place apart, but found nothing but icons and a few potatoes, so they left. The monk, regained consciousness, crawled to his cell, and lay there all night. 1. Holy relic, hair, wood from his monastic cell, stole, ryassa, and stone on which venerable Seraphim used to pray. 2. Pieces of vestments, holy relic and the stone of venerable Seraphim. 3. Earth from the Holy Canal circling the St.Seraphim-Diveevo Monastery, along which the Most-holy Theotokos walked.